Phone app to help you quit smoking? Smokers have a hard time these days, what with having to stand out in the cold every time they fancy a smoke and people around them nagging them to quit. But if you're serious about quitting smoking, you can get help from a new mobile phone application called FixNixer. 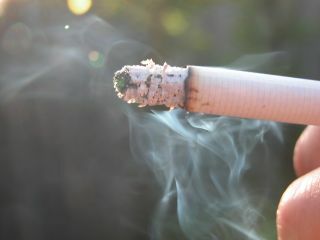 It will nag you about quitting smoking just as you're about to go on a cigarette break. Developed for health agencies in Colorado, FixNixer gets you to fill in an online questionnaire about your smoking habits. It then uses the information entered to send an SMS text message at the times you're most like to get the urge to go on a fag break, Reuters says. "Immediacy is one of the most critical parts of the program," said Jodi Kopke, media director at Colorado's State Tobacco Education and Prevention Partnership. "For someone to say they smoke at 7am, 12pm and 3pm and then to get a message right as they are about to get up and light up, that is so powerful." Sample messages include: "Admit it. Being bored is a terrible excuse to use tobacco. Do you ever say 'I'm bored. I think I'll go expose myself to radiation'? No. Didn't think so". You can also get your friends and family to sign up so they too can pester you with text messages about quitting smoking. Whether this is a useful tool on the road to quitting smoking, or just plain annoying, we'll leave up to you to decide. Either way, FixNixer isn't available over here yet.